Hate em. Can't teach em. Kids are confused by em. Kids never, ever remember em when they need em. This year, like last year, we took the definition of a logarithm and knocked it out of the park. We were all feeling good after Day 1. "This is pretty easy." 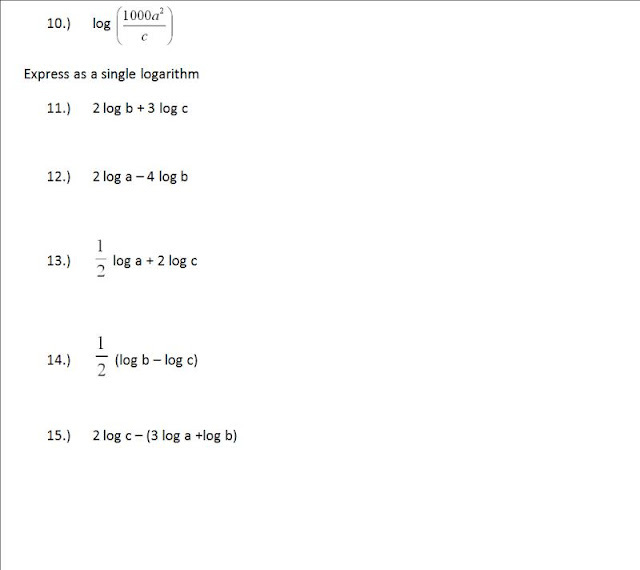 "Why does everyone say logs are such a big deal." Etc, etc. Right on, kids. Right on. Then on Day 2, boom, the fit hits the shan. We left class looking dazed, bewildered, scared. Well this is my third year teaching Algebra 2 and I decided that This Would Not Stand. (I guess I only have one good, new lesson per unit in me every year. But like ten years from now, LOOK OUT.) So we re-did Day 2, differently, and even though losing a day in Algebra 2 gives me an ulcer, it was worth it. Barfity barf barf. It's like I forgot how to teach math. I think I thought this topic was sort of hopeless and useless so I gave up on it for a little bit. I like your approach. One suggestion: #24 doesn't seem to impossible "before". Awesome!I love the pattern finding approach! While I really like your worksheet and can see how it is much more accessible to students than what you've been supplying in the past, I can't help but feel that it undermines the nature of mathematics. While the first worksheet did not lend much to charity, it did have the redeeming quality that it showed the law to be true in all cases. I fear that your new worksheet presents a hidden message that mathematical conjectures can be taken as truths and that proofs are nothing more than showing that a few examples hold true. 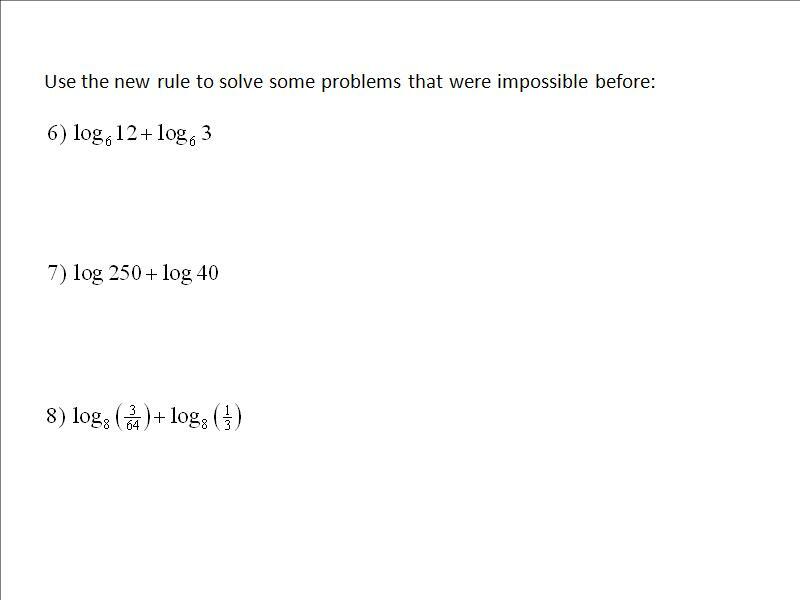 Perhaps it is my naivety to believe that there is a way to combine the clarity present in educated conjectures with the concept of a proof, but I feel like your second worksheet sacrifices the nature of mathematical truth for the easy understanding by the students. That's a lot of problems. Did your students finish all of these? @irrationalcube "I feel like your second worksheet sacrifices the nature of mathematical truth for the easy understanding by the students." I take your point, but I'm not choosing between "easy understanding" and "true mathematical understanding." It's between "some understanding" and "ZERO understanding." They don't have the sophistication to start with the abstracted identities. They just heard the word logarithm for the first time yesterday. 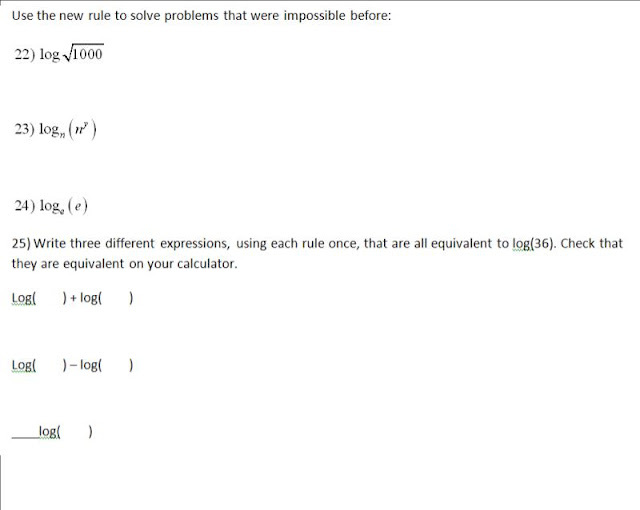 If they don't figure out the properties with numbers first with lots of examples, the whole thing whooshes over their head, and they're just desperately trying to memorize rules that have no meaning to them. Perhaps that just means the right thing to do is numerical examples first, and THEN the proofs. But without all the examples and inductive reasoning and conjectures first, I might as well stand in front of the room and say "beep boop bop beep boop." @MBP Nope. We had to finish them the next day. 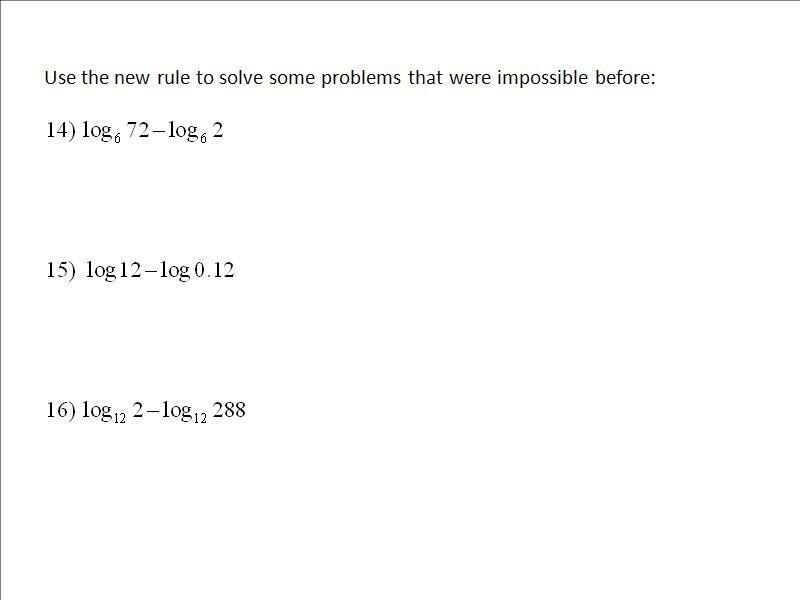 I don't know that I have ever seen Logs introduced your "old" way - while it may indeed provide a more solid theoretical underpinning, I agree that it certainly does nothing to help students who are new to logarithms understand "why do I need this?". I too like your "new" worksheets. 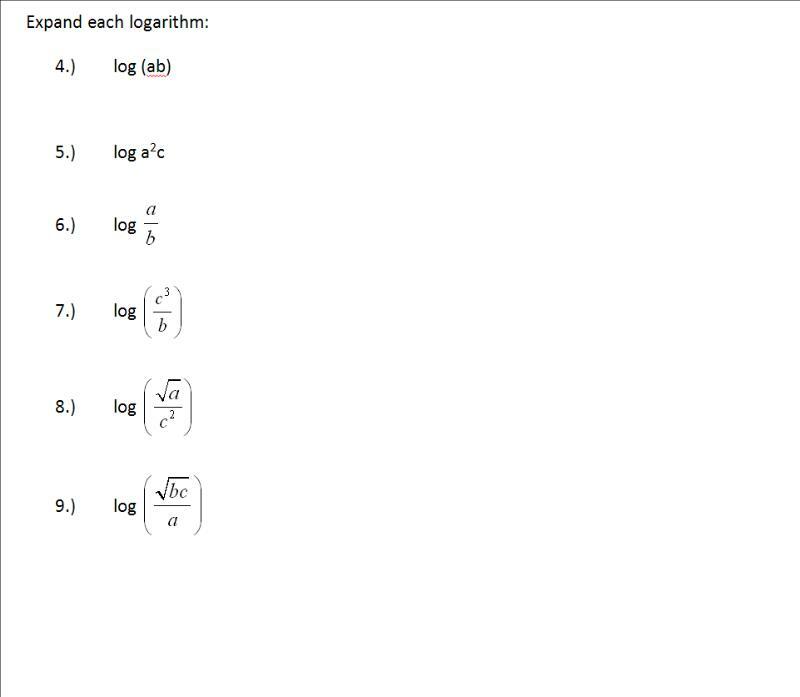 The one element that does not show up in them (which you may have covered the previous day) is: how does one interpret the result of taking a logarithm? 3) Apply the pattern (now a theorem) to new frontiers. The first worksheet seemed to do step 2 and 3, which sounds like it led to utter confusion. The second worksheet seems to do step 1 and 3, which helps the students understand the micro idea better, but (I feel) goes against the structure of mathematical discovery. 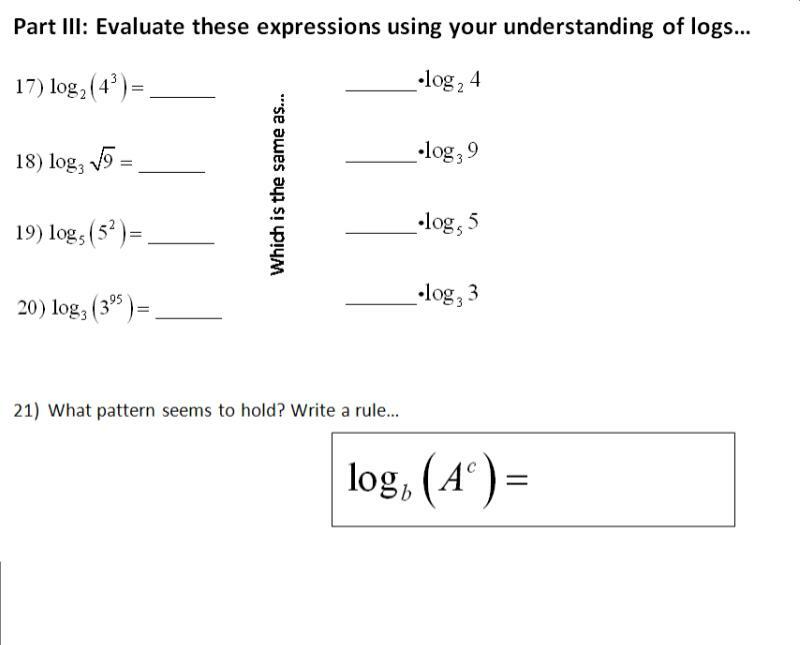 I have no doubt that the new worksheet is an improvement over old one, but I can't help but feel it is still missing something, not essential to learning logarithms, but necessary to understand the subject of mathematics as a whole. I must say I wholeheartedly agree with irrationalcube. You are sacrificing something without which you are not doing math anymore. While the worksheets are great and I definitely will use them next time, I plan to supplement them with a proof - which I will show on board after the students are already convinced by the numerical examples. Is it possible that doing proof and a more complex application problem instead of some of the exercises you have, would give the same or better results in retention and transfer? You should check out Henri Picciotto's SUPER-SCIENTIFIC NOTATION. I saw this maybe 10 years ago at an NCTM conference. Your investigation is great! I really love logs (weird, I know), and I don't have a problem with your inductive approach at all. In fact, I think that it leads naturally to the proofs once completed. "Does this rule always work? How do we know?" HOWEVER, I except about half the eyes in the room would glaze over at that point (if your students are anything like mine) because proofs probably seem like some magical math power you have to a lot of kids at the algebra 2 level. 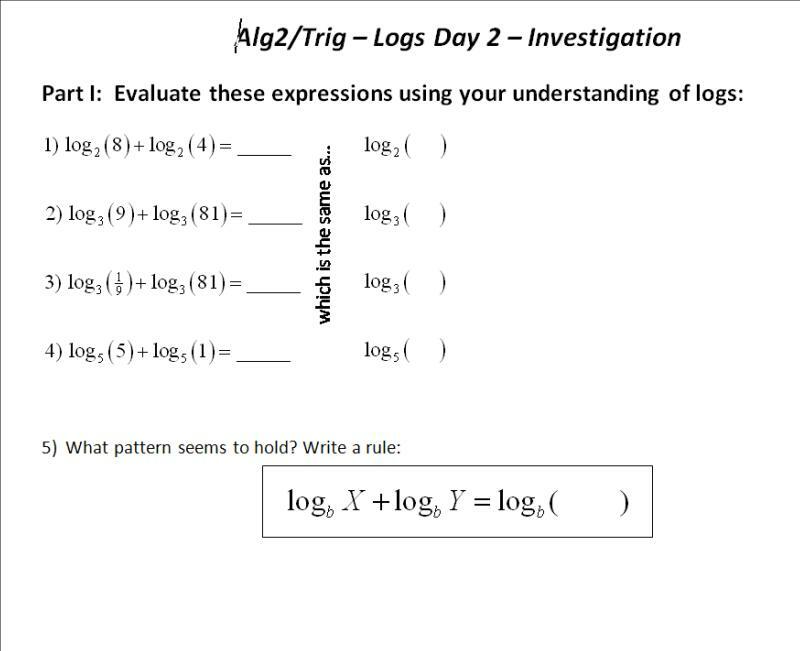 Additionally, I think understanding that particular proof in your post takes more than 2 days of experience with logs to grasp, unless your students are pretty advanced. I think the choice you made was one your students will thank you for, especially since you have to pack sooo much material into that course! I'm a little concerned about all of these comments saying that what Kate did in these worksheets "isn't math". Or at least not "real" math. In my world finding patterns and using inductive reasoning to solve problems, not to mention figuring out ways to solve problems in some way other than "this is how the teacher told me to do it" is, not only "real math", but is better pedagogy than straight lecturing-even if the lecture contains a proof. Save the proof until students have enough familiarity with the material that they can follow the lecture. Then is the appropriate time, not when students are so lost that they can't understand (and thus can't appreciate) the material. I'm not sure if you're referring to my claim that this undermines the mathematical process, but if so, I have clearly failed to make my point. I believe that these worksheets are a great entry point to log laws. Looking for patterns and figuring out ways to make hard problems simpler is exactly what mathematicians do. However, what mathematicians don't do is assume that their pattern holds true after checking that it works for a few examples. Part of what makes mathematics unique is that before we can use a pattern that we notice we need to know that it is true without a feather of a doubt. How do you know this pattern will always work rather than just for the few numbers you tried? Your worksheet is a great way to get your foot in the door, but don't stop there. I'm by no means saying that a lecture is better pedagogy, regardless of whether or not it contains a proof. I'm only trying to say that the rules of mathematics say that whatever passes for mathematical knowledge must be proved to be correct. If you ignore the fact that a proof exists you oppose a part of mathematical discovery. It doesn't have to be taught in a lecture format, or even formally taught at all - but it can't be ignored. You're referring of course to my comment, but you're reading more into it than I intended. Kate's worksheets here ARE great, and I for one WILL use them next time. However, what makes mathematics special is the insistence on logic and generalization. How will students learn this aspect of mathematics if they do not see it used with a variety of topics? How will students learn the distinction between inductive and deductive, without practice with both? How will students learn to conduct proof themselves, or even to convince themselves that something "must" be true for all cases? I find that many students struggle even to understand why deductive reasoning is necessary ("But Miss, I've tried it ten times and it worked", or worse "it says so in the book") and I think these misconceptions come from many years of (at best) inductive mathematics. I saw a beautiful clip somewhere of primary school students talking math, convincing themselves that all even numbers could be written 2n and odd 2n+1. Why not? Why wait until Algebra II or beyond? I don't believe in the distinction full-hour lecture/investigative creative independent work. It's too black and white. Why not start with something investigative, then with more guidance formalize the discoveries made in the investigation. I'd prefer to do that last step at the whiteboard, so everyone can see, but would of course include student interaction. Other possibilities, such as guided independent proof, are also possible, though typically they'll take too much time for my liking. Nothing more to add except that this discussion is brilliant. Thanks everyone for participating. 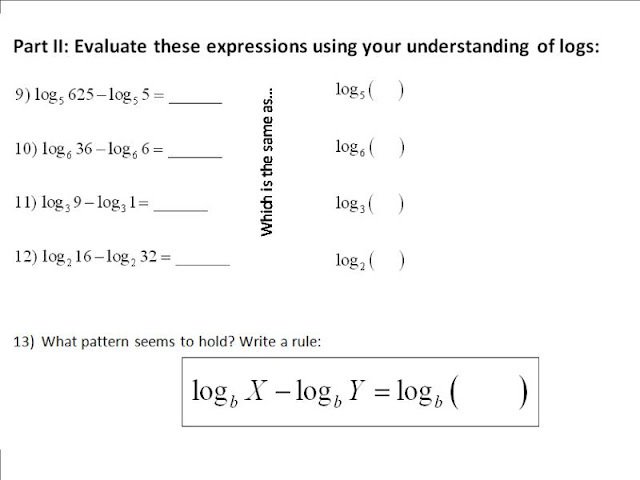 I like the worksheet, but I wonder why we bother to teach logarithms with arbitrary bases. 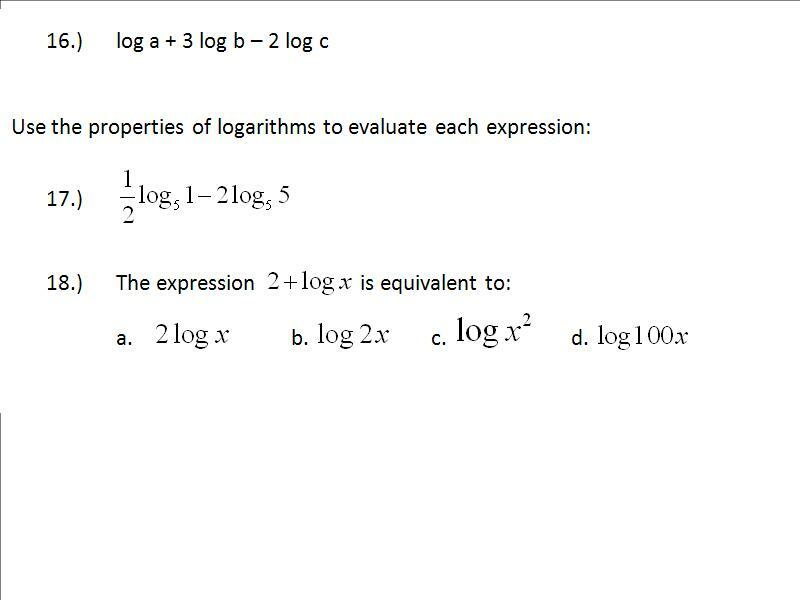 The only important bases of logarithms are 10, e, and maybe 2. 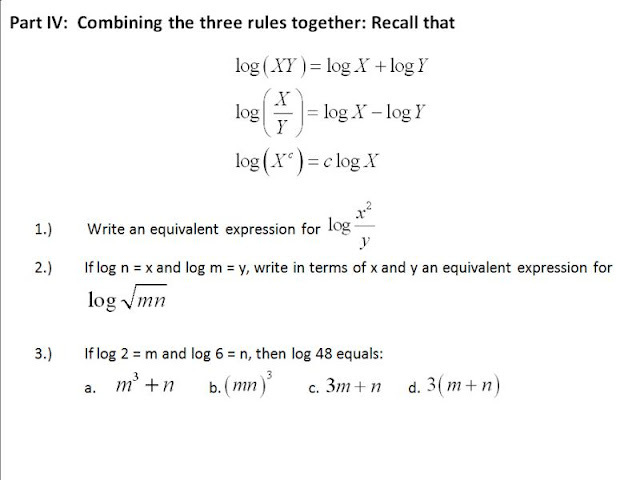 Couldn't we just teach base 10 logarithms in algebra, and postpone natural logarithms until calculus? Julia Tsygan: Once again I find myself saying, thank you for clarifying your thinking. When I read your line "you are sacrificing something without which you are not doing math anymore" my initial reaction was to see red. One of the struggles I have with these types of cyber-conversations is in being able to express my views clearly and succinctly (that and to spell words correctly on my bf's iPad, sheesh!). So I always appreciate it when others take the time to explain in more detail what they meant. Similarly, I certainly did not mean to represent myself as anti-lecturing/only investigation. That's a completely false dichotomy. I was trying to say that we have to think carefully about WHEN we choose to explain things and when we choose to let them explore on there own. And I certainly do think that students generally don't get enough opportunities to explore on their own in a "typical" math classroom. I don't imagine that Kate's classroom is one that I would call "typical" though. b) From knowing me you know I'm sympathetic to irrationalcube's and Julia Tsygan's concerns about the lack of a proof. c) Not sure why everybody's acting like it would be such a big deal. Why not just put "WHY IS THIS HAPPENING??" at the bottom of the page of Part I and at the bottom of the page of Part II etc.? And then at some point have students share answers to this? 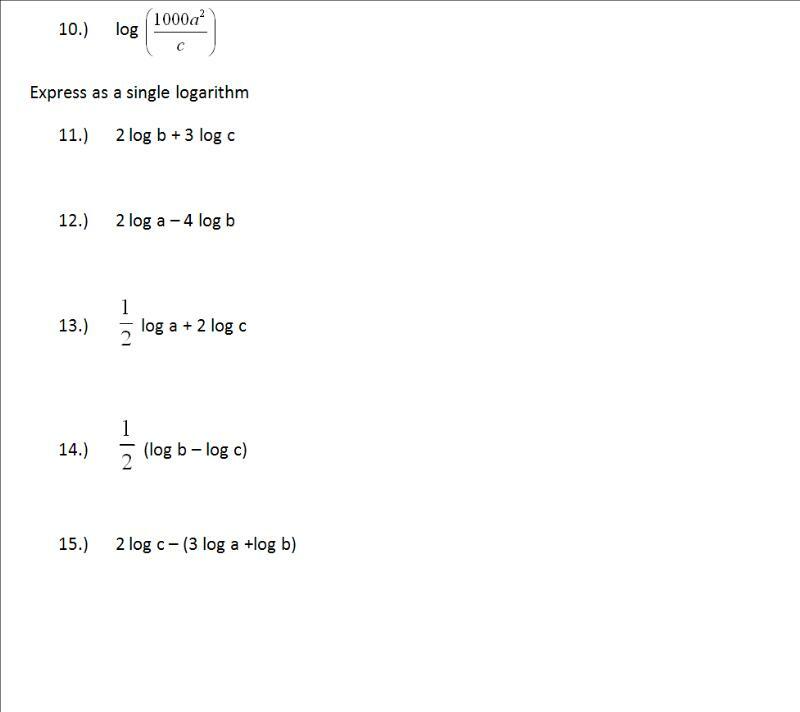 The log laws are not deep results - I don't know your kids but if they can evaluate log_3(9)+log_3(81) = 6 and then can fill in the blank in 6 = log_3(?? ), then I bet they can figure out why the blank has to be filled by 9*81. 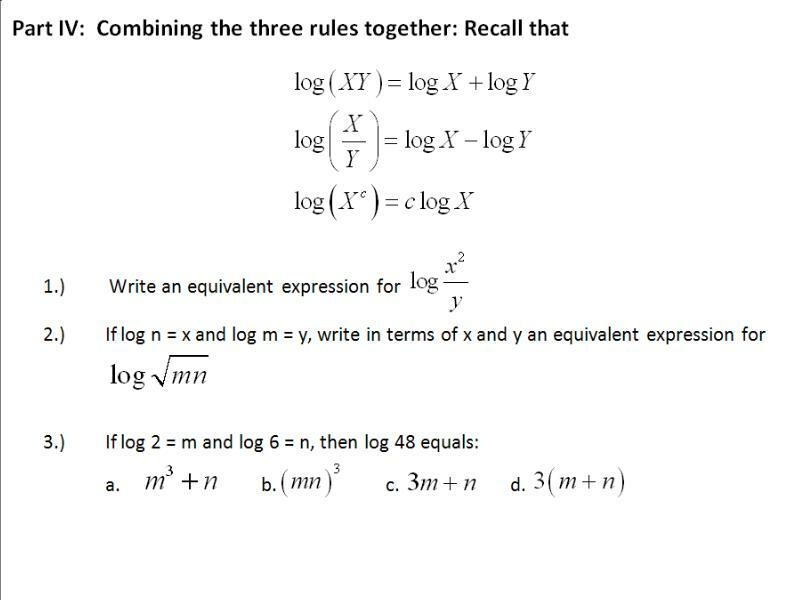 If they need a hint, you can tell them to write all the information they're dealing with in terms of exponents instead of logs. (i.e. 3^2 = 9 instead of log_3(9)=2, etc.) I'm sure they'll be able to figure it out. @ irrationalcube - I just suggested Kate use your proposed order (notice a pattern) - (prove it) - (apply it), but actually I think there's also a virtue pedagogically to doing the proof last. If step 2 is to notice the utility of the pattern if it turns out true, this can create urgency for the proof. (@ Kate - to help in creating this urgency, I think it would be cool to slightly tweak the language on pp. 2, 4, 6 - "if this pattern is true in general, could it be used to solve these problems you couldn't solve before?" - i.e. leave them with a doubt about its truth even while they discover its usefulness - then they'll want it to be true.) And _then_ ask them for a reason to believe it. Now they have an added motivation to want to search for this. @betweenthenumbers: As a fellow Californian and math-wars vet, I totally sympathize and appreciate the discussion. Before I say anything about where I stand in the thread, I gotta think very carefully! Onward: Kate (and others), I'm interested in your perspective on whether it might be better to postpone the whole thing. Is there a chance that there's a developmental barrier? That some (dare we suggest most) Algebra 2 stoonts are just not ready for logs? Bestcase - postponed? What for? The only reason I can see is lack of time due to a overly crowded curriculum. But that presumes that at some future date the student will be in a less crowded curriculum, which is quite unlikely. 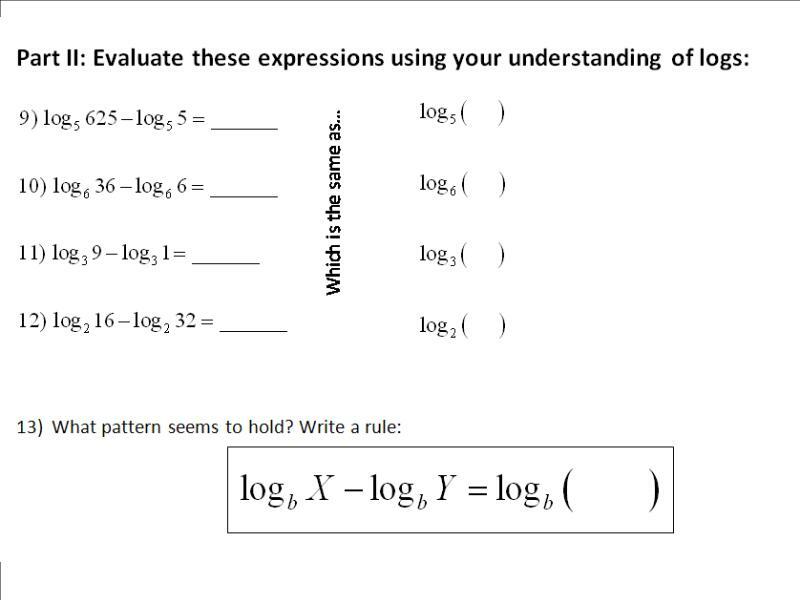 I know I'm a little late to the party, but I did something very similar to this for exponent rules (and since logs are exponents, they're one and the same -- a connection I did my best to make sure was not lost on them). I threw in some extras, though. Some that don't have rules. E.g., x^3+x^5. So many of them went right to x^8 or x^15, only to realize (through graphic representation) that they were dead wrong. Took 'em a while to realize they couldn't come up with something simpler than x^3+x^5. Might the same thing work here in some capacity? Realizing there might be no pattern is just as important as hypothesizing that there is one. It helps with overgeneralizing, too. So I'm a newbie teacher, and this is yet another lesson that I love of yours. One that's kinda sorta similar in that it gets the kids to see the patterns first is this lesson from Illuminations: http://illuminations.nctm.org/LessonDetail.aspx?id=L817. I understand that many have curriculum, time, and state testing constraints that limit the options. But, if i had options, I would stick with base 10 for quite awhile. With base 10, at least the students have have a chance to do some mental computation to check for reasonableness. If the students can't reasonably estimate the values they are working with... It just seems like a bad idea to be working with values that may as well be variables because most students have no sense of where these values would be on the number line.